Discuss aspects of the production of structural steel that make it ideal for building green. Describe the scope of existing conditions study and/or testing involved in structural steel adaptive reuse. Explain the benefits of utilizing structural steel based upon project costs, feasibility and impact on construction schedule. Rising land costs and pressure for increasing the density of our cities have made it necessary to redevelop existing low-rise urban areas. The result is an increasing popularity of existing building reuse and the increasing number of projects building atop existing buildings. Due to its high strength-to-weight ratio, recyclability, and flexibility, structural steel is particularly suitable for adaptive reuse and facility expansion projects. “When evaluated for ease of construction, schedule, cost, dimensional impact, and architectural implications, steel framing is often found to be the optimal solution,” says Eli B. Gottlieb, P.E., senior principal at Thornton Tomasetti’s New York office. Architects have long relied on steel for projects that require design flexibility and longevity. “Steel can be removed, reworked, and reused fairly easily and, in some respects, it is similar to Legos or building blocks that can be deconstructed and rebuilt in a different configuration,” explains Andrea Reynolds, P.E., LEED AP, director of structural engineering at SmithGroupJJR in Detroit. Considered to be one of the most recyclable materials around, today’s structural steel products are made with between 90 percent and 98 percent of recycled materials, according to the American Iron and Steel Institute (AISI). Fashioned from iron, and described as one of the most abundant materials on earth, steel can be endlessly recycled and reused without compromising the properties of the material. Furthermore, on a per ton basis, the iron and steel industry reduced its carbon emissions by 37 percent, and its energy intensity by 32 percent between 1990 and 2013, states the American Institute of Steel Construction (AISC). Although the process of producing steel does require energy, its highly recoverable and recyclable nature makes it a very sustainable material, and in many cases—particularly where existing materials are salvaged and/or reused—fares quite well with LEED building credits (see LEED v4 and Structural Steel). 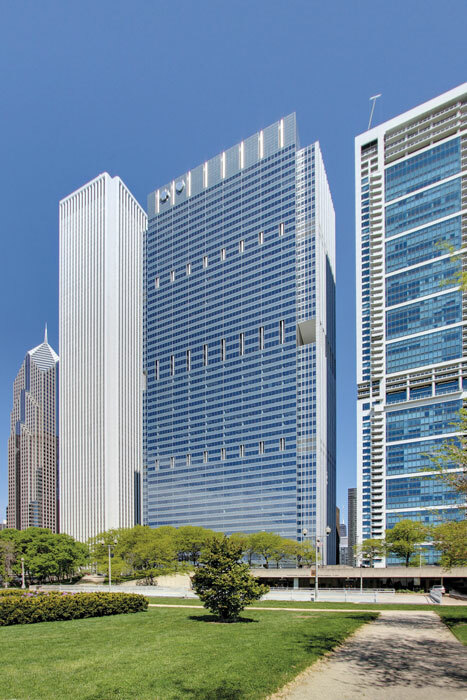 For Chicago’s tallest vertical expansion, adding on a 25-story, 850,000-square-foot addition to the existing 33-story tower at Blue Cross Blue Shield, structural steel leveraged a high strength-to-weight ratio and speed of construction to meet the project’s aggressive construction schedule. Originally published in Architectural Record.